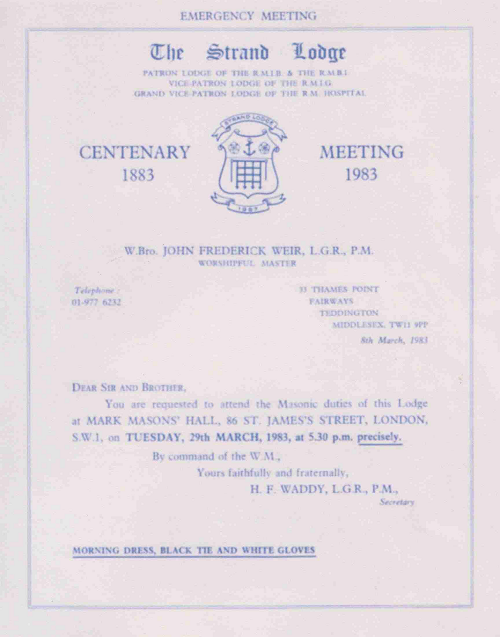 The Centenary Meeting of the Lodge was held by dispensation on Tuesday 29th March 1983 at Mark Masons’ Hall, 86 St James’s Street, London SW1. The Worshipful Master, W.Bro J.F.Weir, LGR, welcomed the Assistant Grand Master, Rt. W Bro the Rt Hon Lord Farnham, who was accompanied by W.Bro J.Ross Guy, Deputy Grand Secretary, W.Bro B.G.Jenkins, Deputy Grand Director of Ceremonies and W.Bro The Rev S.J.Bryant, Assistant Grand Chaplain. 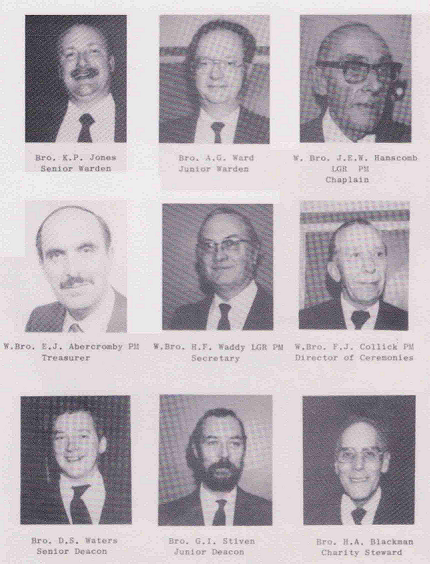 There were present 20 Officers of the Lodge, 5 Past Masters, 4 Members and 38 guests – a total of 67. After the secretary had read the Consecration Warrant, the Brethren stood to order while W.Bro Ross Guy read the Centenary Warrant. The Worshipful Master asked W.Bro The Rev S.J.Bryant to dedicate the Centenary Banner, and a procession was formed. The Brethren stood to order whilst the procession accompanying W.Bro C.R.R.Edwards carrying the furled Centenary Banner entered the Lodge. The banner was placed in its position on its staff and W.Bro F.J.Collick, Director of Ceremonies, unfurled the banner. The Assistant Grand Chaplain pronounced the Dedication Prayer and formally requested the Worshipful Master to receive the banner. W.Bro The Rev S.J.Bryant gave an extremely interesting oration, which included many historical glimpses of the area of the Strand (a copy is appended). The Worshipful Master called on W.Bro J.E.W.Hanscomb, LGR, Chaplain, who announced that W.Bro J.F.Weir, LGR, Worshipful Master, W.Bro E.J.Abercromby, Treasurer, and W.Bro H.F.Waddy, LGR, Secretary, had donated three silver goblets to the Lodge for use by the Worshipful Master, Senior Waden and Junior Warden at the Festive Board. The goblets were inscribed with the Lodge Badge, Centenary dates and the names of the donors. As the longest serving member of the Lodge, some 56 years, W.Bro J.E.W.Hanscomb called on the most recent Initiate, Bro J.C.S.Perry, to assist him in presenting the goblets to the Worshipful Master, the Senior Warden and the Junior Warden. The Worshipful Master thanked W.Bro H.F.Waddy, Secretary, for his efforts in organising the Centenary Meeting and Festive Board, and, in appreciation of his work, asked him to accept a glass goblet inscribed with the names of W.Bro H.F.Waddy and W.Bro J.F.Weir, the Lodge Badge, the Centenary dates, the date of the Centenary Meeting and the words “Meret Qui Laborat”. The Lodge was closed in due and ancient form, with solemn prayer, at 6.30pm. The first verse of the National Anthem was sung, and the Worshipful Master, accompanied by the Assistant Grand Master, the deputation from Grand Lodge and the Brethren retired to a good repast, when the contents of the Charity Box amounted to £100. This evening we are meeting together in order to mark the Centenary of this Strand Lodge, which was Consecrated on Wednesday 14th February 1883. 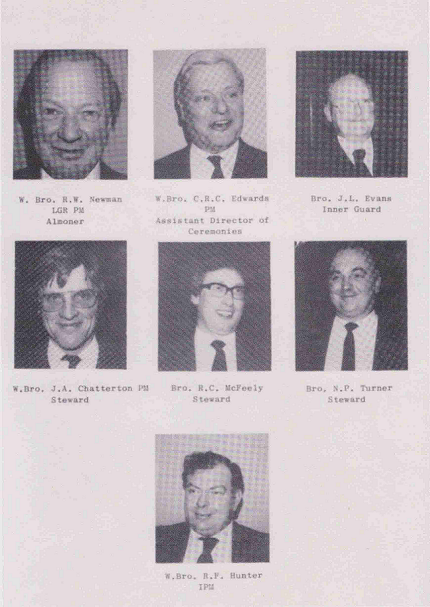 In his most interesting “Retrospect 1883 – 1983” W.Bro Waddy has set down for us, and for this Lodge in the years ahead, an excellent history, in which we read: “many of the original Petitioners had a definite local connection…the Petition was written from Ashley’s Hotel in Henrietta Street, only some four-hundred yards from our present home”. It was there, the birthplace of the famous painter, Joseph Mallard William Turner, RA, the son of a barber, in 1775, that the Ceremony of Consecration took place. – the Consecrating Officer being VW Bro Colonel Shadwell H.Clarke, PGD, the Grand Secretary. William P.Frith, in his “My Autobiography and Reminiscences”, wrote: “at a dinner when I was present, a salad was offered to Turner, who called the attention of a neighbour at the able to it in the following words: ‘Nice cool green that lettuce, isn’t it? And the beetroot pretty red – not quite strong enough; and the mixture, delicate tint of yellow that. Add some mustard, and then you have one of my pictures’ “. Turner spent the last days of his life in Cheyne Walk, Chelsea, where he lived with old Margate landlady, Sophia Caroline Booth, whose surname he assumed, and passed himself off as a retired Admiral. The young people there, however, had very little respect for the Senior Service; they called him ‘old Puggy Booth”. Let us reflect a little on the Strand itself. It takes us back to the Roman occupation of this country, for, on the south side, opposite the church of St Mary-le-Strand, was a tortuous passage known as Strand Lane. Here was a Roman bath, fed by a perpetual spring, which a century ago was still used by the public. Charles Dickens frequently did so, and in ‘David Copperfield’ he wrote of it: “There was an old Roman bath in these days on the bottom of one of the streets out of the Strand – it may be there still – in which I have had many a cold plunge”. Opposite the church of St Clement Danes there was another narrow byway, steeply sloping down from the Strand, called Milford Lane. It ended at Milford Stairs, as the map of London in the 1660s shows on the inside back fly-leaf of ‘The Illustrated Pepys’ edited by Robert Latham, published for the 350th anniversary of his birth a month ago, 23rd February. There used to be a mill, a ford and a forge here. The forge was situated in Tweezers Alley, near the foot of a lane; it was required for the horses stabled near at hand by W.H.Smith and Son. In the church of St Clement Danes the great Dr Samuel Johnson used to worship, and there is a statue of him in the building. From 1748 to 1758 he lived at 17 Gough Square, which opened out from Wine Office Court – the passage beside ‘The Cheshire Cheese’ in Fleet Street. It was there that he compiled his famous dictionary, and wrote ‘Rasselas’ in a single week to defray his mother’s funeral expenses. This lexicographer once said: “I think the full tide of existence is at Charing Cross”, suggesting that The Strand has always and ever been a place of busyness! Now let us catch a glimpse of the atmosphere around the time that this Strand Lodge was consecrated. On 7th January of this year Australia duly and deservedly regained the Ashes at Sydney. It was on August 30th 1882 that the ‘Sporting Times’ published an obituary notice: “In Affectionate Remembrance of English Cricket, which died at the Oval on 29th August 1882. Deeply remembered by a large circle of Sorrowing Acquaintances. R.I.P. N.B: The body will be cremated and the Ashes taken to Australia”. It was in 1868 that a start was made on the royal Courts of Justice, designed by G.E.Street, RA, who died before he could see his work completed. The building cost £700.000; the land, however, cost £1,413,000. It was just ten weeks prior to your Consecration that its opening ceremony was presided over by Queen Victoria, on December 4th1882. Four years previously, another landmark was disposed of – Temple Bar, built by Sir Christopher Wren in 1670. The City gave it away to any who would have it, and Sir Henry Meux put it up, stone by stone, as one of the gates to his park at Theobolds, near Waltham Cross. However, the ‘City of London’ number of the ‘Times’ of 8th/9th November 1927 stated: “Thirty years later the City wanted it back again but could not have it. So much the better! Temple Bar anywhere in London except at its old place would be a dethroned monarch kept as a show. But if the City wanted to pay it a compliment they might remove that horrible pillar by Boehm which burlesques an ancient grandeur. Ten days ago, the ‘Times’ reported that the Temple Bar Trust now wants to place this monument next to St Paul’s Cathedral. I reminded the editor of this 1927 issue and this morning received his reply: “It has not been possible to find a place for it in the correspondence columns”. 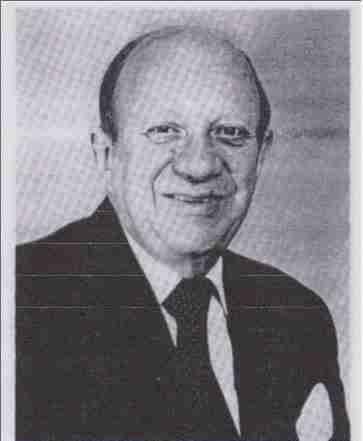 Two months ago, on January 18th of this year, the Franks Report was published concerning the Argentine invasion of the Falkland Islands. In the middle of July 1882 the then Prime Minister, William Gladstone, had to act similarly concerning Egypt. He obtained a Vote of Credit for £2,300,000 and 32,000 troops left this country, and 8,000 were sent from India. On September 13th, at the battle of Tel-el-Kebir, in half-an-hour at dawn, Ahmed Arabi Bey’s forces were routed. A month after your Consecration, on March 15th 1883, a gang of Irish-Americans set off bombs in the Local Government Board Offices in Whitehall, and in the ‘Times’ offices in Printing House Square, with the result that, on April 9th, Sir William Harcourt, the Home Secretary, had a bill passed through all its stages, which received the Royal Assent the next day, to deal with what he termed “the pirates of the human race”. Then, quite by chance, a few days ago I came across this booklet, priced one shilling, which belonged to my father: “An entirely original Fairy Opera in Two Acts entitled Iolanthe or The Peer and the Peri, written by W.S.Gilbert. Composed by Arthur Sullivan”. It was “Produced at the Savoy Theatre, under the management of Mr R.D’Oyle Carte Saturday Nov, 25 1882”. The original programme is bound within the book: “’Private Wife’ a New and Original Vaudeville. At 8.40 ‘Iolanthe’” – and it says: “Programmes are provided and Wraps taken free of charge. Any attendant detected in accepting money from visitors will be instantly dismissed; the public is therefore requested not to tempt the attendants by offering them gratuities”. Having, therefore, given consideration to things which must have had a bearing on the lives of the Brethren of this Lodge one hundred years ago, and seen the interesting way in which history, and its vicissitudes, have a peculiar habit of repeating themselves, let us now take stock of what we ourselves are doing this evening as we dedicate this Lodge Banner, most kindly given by W.Bro Charles Edwards, Master of this Lodge from 1980 to 1981, and beautifully made by his wife. It will mark, in the years ahead, as a fitting reminder of this important Centenary evening. In the V.S.L. we shall find that the ancient Hebrews had two quite different words for what is translated by our word ‘banner’. Firstly, there was the word ‘nes’, which alluded to the ‘banner’ or ‘pole’ set up on some high hill or prominence, so as to act as a rallying point. Consequently, whenever this Lodge Banner is placed in its rightful position here in the Lodge, then it is the duty of every member of this Strand Lodge to rally himself, and assemble in Lodge. Secondly, there was the Hebrew word ‘degel’, inferring that which was meant to be seen. This banner should remind us all in the years ahead, that we are pledged to enter the Lodge, and work with that love and harmony which should at all times characterise Freemasons. So, bearing these two facets in mind, may the members of this Strand Lodge always strive to “raise a superstructure perfect in its parts and honourable to the builder”, both within the Lodge and without, in the remainder of their daily lives and existence. Finally, to conclude this Centenary Oration, let us use the three figures 1-0-0 to reflect upon the three words INAUGURATION, OPPORTUNITY and OBLIGATION. Those three words can say to us today, just as they did in1883, that, here we are, meeting together, setting forward into the unknown future, full of opportunity, with the great obligation to ensure that the grand principles and tenets of our beloved Order will be even and ever more gloriously imprinted upon the history of this Strand Lodge in the generations ahead. “May Brotherly Love, Relief and Truth ever prevail amongst its members”, for there is an opportunity, and an obligation as we inaugurate the coming Centenary, to ensure that this will indeed be a Lodge in which all the members “will duly appreciate the value of Freemasonry, and indelibly imprint on your heart the sacred dictates of Truth, of Honour and of Virtue”. May the guidance and the light of the G.A.O.T.U. be yours at all times, and, may His Divine Blessing rest upon all the labours of this Strand Lodge.